Apply for Financing now!No obligation by Applying. 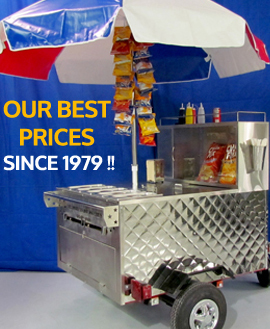 Get an Instant Credit Decision for your New Hot Dog Cart! Questions about Financing? Call Trace LaBarr at: 800-770-8107 x 1103 or click here to email him. ALL AMERICAN was founded in 1972 on the premise that the customer is always king. We recognized that the need to supply people with their own low-cost, fairly easy to run profitable business was real. Copyright © 2015 All American Inc. All rights reserved.